…and came down a mountain. There aren’t many movies made about map makers, surveyors or cartographers. Damned few. The tedious film ‘The English Patient’ usually comes to mind, although the map making connection is just a plot mechanism to explain why a Hungarian count with an impeccable English accent is poking around Egypt and North Africa. I don’t think a map is shown in the entire movie. In the opening scenes of ‘Lawrence of Arabia’ we see Lieutenant T. E. Lawrence helping to color a map in a military office in Egypt. This is a pretty accurate snapshot of Lawrence’s activities before he was sent out to foment revolt among the Arab tribes. Before WWI Lawrence worked extensively as a field archaeologist in the Transjordan region and was a skilled map maker. During WWI he was initially employed in making military maps of the Middle East. Back then cartography and field survey were essential skills for explorers of all types and Lawrence was no exception. There’s lots of other movies with oblique references to maps, mapping and surveying. The Indiana Jones series comes to mind, as does the 1999 movie ‘The Mummy’, but that’s about all I can t hink of right now. So back to our movie. ‘The Englishman Who Went Up a Hill But Came Down a Mountain’ is the only film I can think of that revolves around surveying and cartography. The movie is loosely based on the true story of a group of Welsh villagers who, during World War I, conspire to have two British Ordnance Survey cartographers designate their local hill a true mountain so they can continue to lay claim to having “the first mountain in Wales.” At its heart the movie is the story of a village, devastated by the loss of its young men on the battlefields of France, that struggles to retain its dignity. 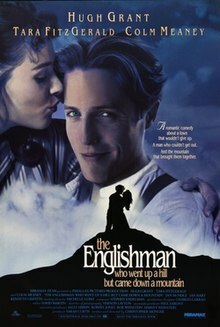 There’s also a charming love story woven into the plot between one of the cartographers (Hugh Grant) and a local girl (Tara Fitzgerald). The film is stuffed full of colorful characters who are all in cahoots to keep the cartographers in town while they surreptitiously add 20 feet to the top of their hill so it meets the minimum elevation requirement to be called a mountain. Hence the somewhat long title. The movie is a charming period piece. Whoever did the costuming did a great job. The scenes of the two cartographers working atop the mountain, kitted out in all sorts of period field gear are fun to freeze frame through (I particularly like Hugh Grant’s leather map case). The one glaring mistake the director made is having the crew use a dumpy level in the place of a surveyors theodolite to measure the angles between adjacent hills, but I’ll forgive that slight hiccup. Everything else looks spot-on, including the scene where Hugh Grant is doing some preliminary cartography work using an adjustable steel tipped pen and bottles of ink. The movie is slow and charming. A classic little English gem. It would be a great film without all the mapping and surveying stuff, but having it all in there makes it even better. Highly recommended for rainy days. This entry was posted in History, mapping and tagged movie by Brian Haren. Bookmark the permalink.